When Is It Time To Add Poses in the Ashtanga Intermediate Series? When is the right time to begin to add poses in the Ashtanga intermediate series? In the previous two posts in this series, I discussed when to add poses in the Ashtanga primary series and I answered Kara’s question on the pros and cons of staying in primary series. Those first two posts are related to another question: When is the right time to add poses in the Ashtanga intermediate series? The short answer is, if you have a teacher who is guiding your practice, then they will tell you when it’s time to add poses in the Ashtanga intermediate series. But, what if you aren’t able to practice with a teacher? How do you know when it’s time to start adding second series? If we have the idea that the Ashtanga vinyasa practice is a method intended to take us somewhere, then we are practicing with the bias that the method has a purpose. It’s not just random postures. Part of the method is the individual postures and part of the method is also that the postures go in an order, a sequence. Just like primary series postures, the intermediate sequence postures do not live in a vacuum. The effect of working a posture can be very different when it is placed in a sequence of other postures, rather than just practiced alone as an isolated pose. Like practicing the primary series, when you are practicing the intermediate sequence, the postures are in relationship with one another. Also like primary series, the intermediate series is built on a foundation. That foundation is the primary series. From that perspective then, we could say that a student is ready to add poses in the Ashtanga intermediate series when the components of primary series have been developed. That includes a sufficient understanding of breath, bandha, and dristi while performing asana. Again let me say that, when I’m teaching, my emphasis is on: 1) building the practice and patterns of movement in a way that is appropriate for each individual, and 2) helping the individual develop patterns of movement that are appropriate and useful for the long-term development of the sequence. Like my answer to the question of adding poses in primary series, my answer to the question of when to add poses in the Ashtanga intermediate series has both an anatomical perspective and a yoga perspective. The movement themes of intermediate series build on primary series, are related to primary series, and are different from primary series. All of those are true. If we were to say that one theme of the primary series is to direct attention to the pelvis and hip joints, then we could say that one theme of the intermediate series is to direct attention to the spine and surrounding tissues and organs. We need mobility and range of motion around the pelvis and hip joints to access range of motion and mobility of the spine. The spine is rooted in the pelvis. If the pelvis is “stuck” or restricted in some way, then it limits where and how the spine can move. If the pelvis is “stuck”, then that tension can potentially send more force upward into the spine, depending on the postures. With this idea in mind, we could say that the postures in the Ashtanga second series continue the work of primary series to develop increased range of motion in all directions at the hip joints. Second series also asks for greater range of motion of the spine in relationship to the pelvis. The intermediate sequence requires us to bend forward, backward, and twist more deeply than we have experienced in the primary series. The intermediate series also works to develop a foundation of strength to support this greater openness. These aren’t the only movement themes that you can find in the Ashtanga intermediate series of course. If you look carefully, it’s possible to find enough threads of different kinds of movement in second series for a lifetime of practice! So, anatomically, how might we understand these movement themes of the intermediate series to be related to what is present in the primary series? How would that understanding lead us to decide when to begin to add postures in second series? In the primary series (not including the six fundamental standing asanas), we have two twists, Marichyasana C and D. Both ask us to bind around one knee with D asking the binding to be around a half-lotus and a knee. The intermediate series begins with pasasana, which asks us to deepen our twist and bind around two knees. Anatomically then, I would want to see that a student has spent sufficient time working the twisting aspect of Marichyasana C and D and at a minimum be able to be bound in D before beginning pasasana. We have just one posture in primary series itself with any sense of opening the front of the body, purvottanasana, and just one posture in primary series with an emphasis on strengthening the back of the body, setu bandhasana. We do, however, have an opportunity to work with these intentions in urdhva dhanurasana as part of closing sequence. The beginning of intermediate series strings together a series of many postures with these two intentions, so from an anatomical perspective, I would want to see that a student has spent adequate time exploring urdhva dhanurasana before beginning to add poses in the Ashtanga intermediate series. Often times being able to drop-back and stand up into a backbend is a measure of whether someone is ready to begin second series. I would say there are some good reasons for this without making this as an absolute rule, as there are exceptions for anatomical reasons. Related to dropbacks, there is a level of trust and overcoming fear that is learned from dropping back and standing up. Learning to let go, and building confidence in oneself, is important as we head into second series where we find deep backbends in the form of kapotasana and deep forward bends in the form of eka pada sirsasana. Get the nervous system ready! In primary series we have one leg-behind-head posture, supta kurmasana, and we have many postures with a forward bending aspect. Second series builds on that foundation by including three leg-behind-head postures. When you add this to the titibasana sequence you have a good group of postures that have a deep forward bending aspect. They require a much deeper range of motion in that direction than most postures in the primary series. Essentially you now have to take your torso through your legs, not just toward your legs. Anatomically then, I would want to see that a student has spent adequate time exploring supta kurmasana and has established an appropriate amount of ease in forward bending for their individual body before beginning to add poses in the Ashtanga intermediate series. In the primary series, there are many postures that work external rotation of the hips and half-lotus position. By the time we are practicing all of the postures in primary series, we have likely spent a considerable amount of time working this action. This is an important range of motion to have well-established before moving too far into the intermediate sequence, because intermediate series asks more from the body in terms of the external rotation required. This shows up in second series in the three leg-behind-head postures, as well as multiple postures that incorporate lotus or half-lotus. Within second series, there are several postures that include a half-lotus position and full lotus is incorporated into a backbending type posture in supta vajrasana and even a forearm balance in karandavasana! In the primary series we can begin to develop a relationship with serratus anterior to create a stable shoulder girdle in sun salutations, jumping forward and back, many chaturangas, as well as lifting up the body to jump back and jump through. Even postures like bhujapidasana and kukkutasana have us working with the shoulder girdle in a way that we create stability. In second series we build on this foundation with even more challenging movements such as jumping into bakasana B and balancing on our forearms in pincha mayurasana. Anatomically then, it seems important to have established some awareness and control over the action of serratus and other muscles that create stability in the shoulder girdle. One of the movement themes that runs throughout the intermediate series is that of “resisting gravity” and going upside down. There are many postures and transitions where we are working to hold ourselves steady or move against gravity. We begin to explore this idea in primary series in postures like utthita hasta padangusthasana and bhujapidasana as you try and lower down with control and in the transitions out of utkatasana and warrior 2 in the “up” position. It even shows up in finishing sequence with holding a half headstand. While this is a movement pattern that we can continue to refine forever, it’s important to spend some time working with this intention in primary series before taking it to the next level in the intermediate series in postures such as bakasana B, nakrasana, and lowering into and coming out of karandavasana. Just as the intermediate series challenges us in new ways from an anatomical perspective, it asks us to keep growing as yoga practitioners in many other ways as well. Part of deciding whether you or a student is ready to begin to add poses in the Ashtanga intermediate series is evaluating the stability of the other aspects of practice. Part of adding intermediate postures is working with mental endurance. If intermediate postures are added slowly, one by one, then the student’s individual practice is getting longer each time a posture is added. The mental practice of staying present rather than allowing yourself to dwell on how many more postures you have left to practice has value. Increasing the amount of time during which you are trying to sustain mental attention is part of the practice. If you’re wondering whether it’s time to begin adding intermediate series postures to your practice, consider the steadiness of your attention in primary. Are you able to sustain focus on the practice without breaks to reorganize your towel, mat, hair, etc.? How is your physical endurance? When you finish a primary series practice, do you have physical energy left to add more? 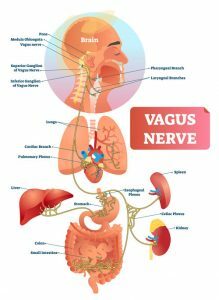 Before adding the additional input into your nervous system from intermediate series, consider your emotional and energetic landscape when practicing primary. Do you feel stable, grounded, and able to transition from practice into the “real” world when you finish your practice most days? The intermediate sequence will challenge breath control in new ways. Have you established a pattern of even, full breathing in primary series? 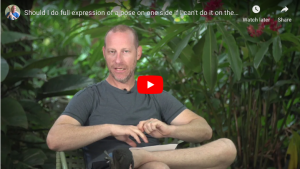 Have you been engaged in the practice of learning to consciously choose to breathe fully even in postures that feel uncomfortable or challenging? Have you been working with the intention of using the internal locks, or bandhas, in conjunction with the breath? Where are you at in your commitment to practice? The journey of intermediate practice can go deep. If it’s practiced once-in-a-while or sporadically, it is much less likely to go somewhere and I think it has a greater potential of even being injurious. While everyone does not necessarily need to adopt a 6-day-a-week routine of 2-hour practices, intensifying practice by beginning to add intermediate postures does take a time commitment and consistency. Just as there is no “one” answer and no “right” answer to the question of when to add poses in the Ashtanga primary series, there is no “right” answer to the question of when to add poses in the Ashtanga intermediate series. How and when you begin second series should be related to your intentions for practice. As with primary series, practice of the intermediate sequence offers many potential benefits and challenges. Ultimately, no matter which postures we’re practicing, every day is its own adventure. Thanks for sharing, this yoga practice is for everyone.